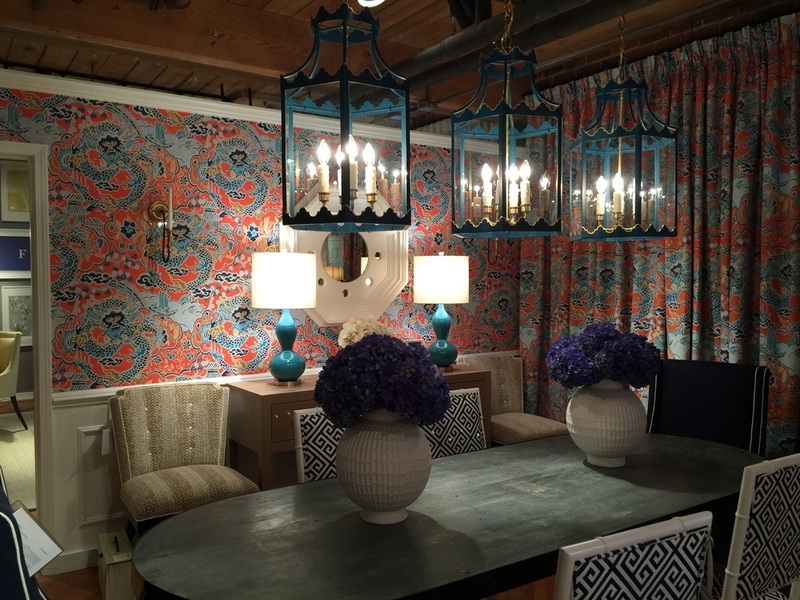 Twice a year, tens of thousands of interior designers and home decor store owners descend upon the small, sleepy town of High Point, North Carolina for High Point Market. The event brings together more than 2,000 exhibitors across 180 buildings in one location. It's a designer's dream! For me and JBi, this is an opportunity to see the latest products from the top manufacturers in the home product industry. I'm looking for new furniture, lighting, accessory and art I can use to put together great rooms for my clients. While attending a trade show can certainly be fun with numerous parties and meeting leaders in the industry sounds, it's also a ton of work. On average, I'll visit 100 or more showrooms over a 5 day time period - that's 20 or more showrooms per day. It's a lot of walking, talking, sitting (trying out all the furniture from trusted and new manufacturers so I can be assured the highest quality for my clients) and learning about all these products. And, yes, there are certainly some great moments. This year I had the privilege of meeting Gary Inman, a distinguished designer in the resort and hospitality arena. He gave a great talk on the Art of Collecting (look for something on this topic in later post). Previous years gave me the opportunity to meet Thom Filicia and Barclay Butera, two amazing designers and founders of great brands of products I use on a regular basis. So, back to Market. Each year, I look for a common thread in the products manufacturers are showing. A few years ago, in the midst of the recession, I noticed that furniture had a distinctly simple feel. Manufacturers had simplified their profiles and used more reclaimed materials. Everything appeared very modest, even for the higher end manufacturers. As the economy continues to improve and the furnishings industry is seeing a great rebound, manufacturers are starting to be bold again in their design choices with an increased use of patterns and finer details in casegoods. I believe these trends will continue for a years to come as the industry continues to bounce back and homeowners want to fill their homes with the finer things in life. In this room by Thibaut, the wallpaper and chair fabrics (three different ones, by the way) fill the room with color and pattern. I saw this over and over in manufacturers of all levels and types of products. This beautiful use of ribbon by Hancock & Moore is another example of details done the right way. Over and over, casegoods are moving away from the overly simple and rustic look to a more refined aesthetic with beautiful details. 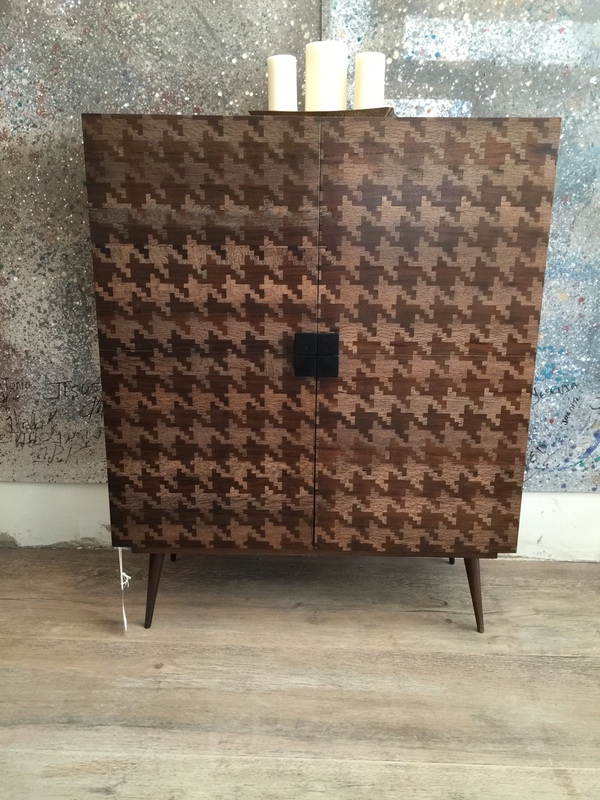 Taracea's small bar cabinet is created using wood inlays in a houndstooth pattern. A contemporary use of the inlay technique and simply stunning! 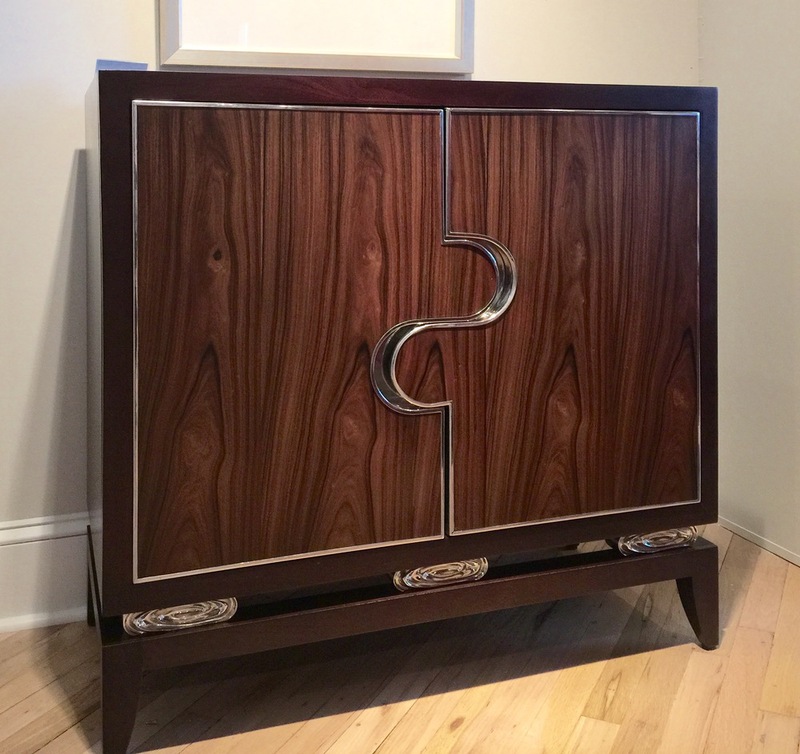 Another example of detail in casegood by Century Furniture shows a bar with stunning chrome details as metal inlays and other details on the base. 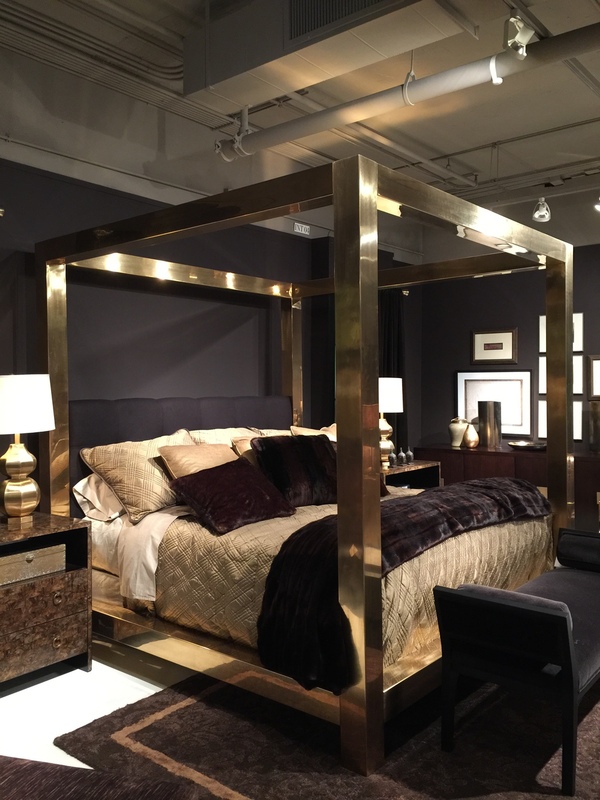 And, Bernhardt, one of my favorites, dare not be left out of the game with this stunning aged brass bed and lacquered capiz shell nightstands. Even the live edge movement is getting into the groove. This maple table by The Table Factory has a metal zipper detail down the middle that would be the talk of any dinner party or gathering around this table. Even art is getting into the game. 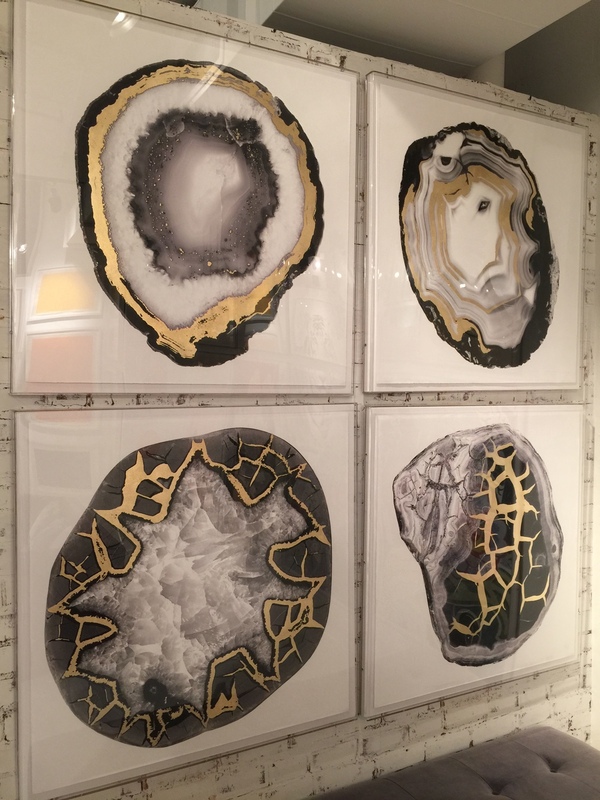 These screen prints of geodes by Natural Curiosities are highlighted with gold leaf details that make them shine! Literally! 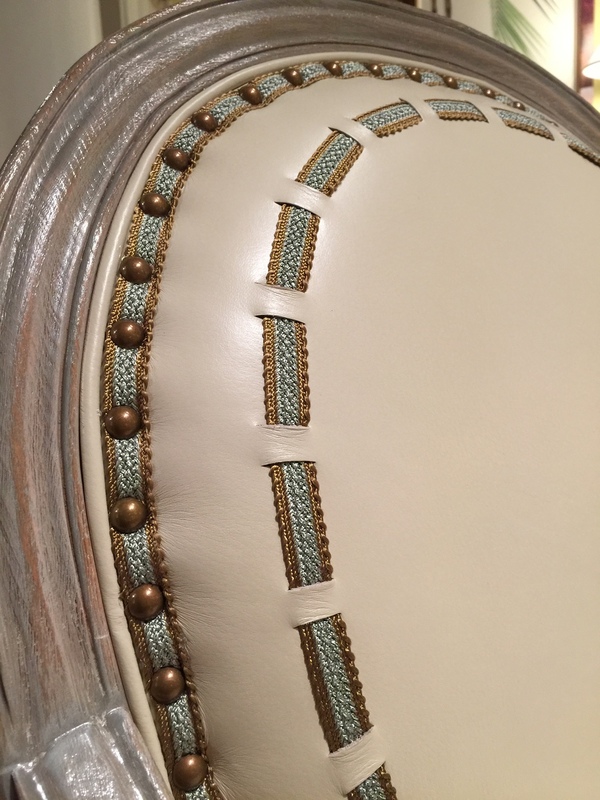 Upholstered furniture is seeing an increased use in details as well. These two pieces, one by Henredon and one by Taylor King, show the level of detail possible with upholstered furniture. So, where does this leave us? Well, I believe in a good place. Designers have more and more great products from which to choose and homeowners will likely start desiring an increased use of details in their own homes. That sets us all up for some great design to come down the road in the coming years. And, of course, if you're ready to start bringing some extra detail to your home, you know who to call (that would be me, right?!) 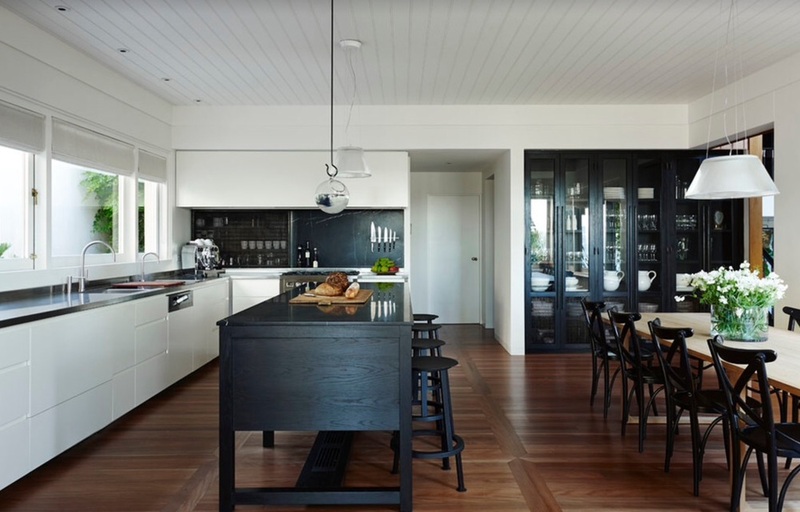 - go to this page to get started redesigning your home. From a designer's perspective, drapery is one of those key elements in any rooms that helps the room feel finished. Their presence in a room can dramatically change a room to either be formal or informal, or contemporary or traditional. Often times it is the type of pleat used that plays the crucial role in determining the finished style of the drapery. Yes, you'll notice that I left out the fabric in the above paragraph. That was completely intentional. There are millions of fabric options and the style of the room often dictates the type of fabric selected for the room. Fabric content, pattern, etc. will all come into play when selecting drapery fabric that fits the particular style of your room. Moving on the pleat styles...open up any drapery design book and you'll see a huge range of pleat styles and looks, from incredibly ornate to simple, contemporary forms. While every pleat style has its place, we at JBi definitely have our favorites - pinch pleats (euro or regular style), grommets and ripple-fold to name a few. I'll throw in one extra style for good measure, something for the more traditionally minded folks. The pinch pleat is probably the most well known pleat style. 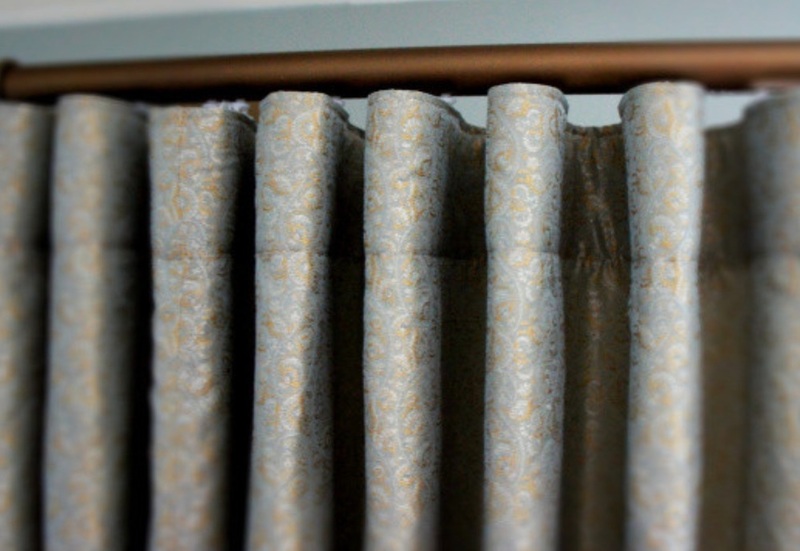 The pleat is made by gathering fabric together at regular intervals along the top of the fabric panel. The number of gathers in the pleat are called "fingers." A two-fingered pleat has two gathers, a three-fingered pleat has three and so on. If the pleat is made by gathering the fabric some distance down from the top of the panel (usually about 2 inches), this is called a pinch pleat. When the pleat is gathered at the top of the panel, the pleat is known as a Euro pleat. For a distinctly contemporary look, many use either a grommeted look or ripple-fold. These have similar looks but use different methods to create the look. A grommeted panel has large metal rimmed holes punched in the top of the panel through which a rod or taut wire is run. The fabric simply creates an "S" shape along the hanging mechanism. Ripple-fold drapery has the same "S" shape but is created by using a special connection from the top of the drapery to ripple-fold track. The track allows the drapery to easily be moved across the length. A measured string is used inside the track to keep the "ripples" at equal distances along the hardware, thus the name ripple-fold. For good measure, let's look at one more pleat style, something on the more traditional side of things. The reverse box pleat is one of my favorite styles for a more traditional look. Think a pleat but in reverse - the part of the pleat that normally is in the back comes out to the front of the panel and are then connected. Sometimes a button or other decoration is used to connect the pleats in reverse. This type of pleat style is best used for fixed panels. I hope this quick primer gives you some ideas on what to do with your next drapery project. Happy drapery-ing! The joy of being an interior designer is getting the opportunity to push the design boundaries every once in a while. In doing some inspiration research for an upcoming kitchen design project, I began to notice the rarity of kitchens with really interesting color stories. I'm not necessarily criticizing the choices designers and homeowners have made, but we need more color in this world! 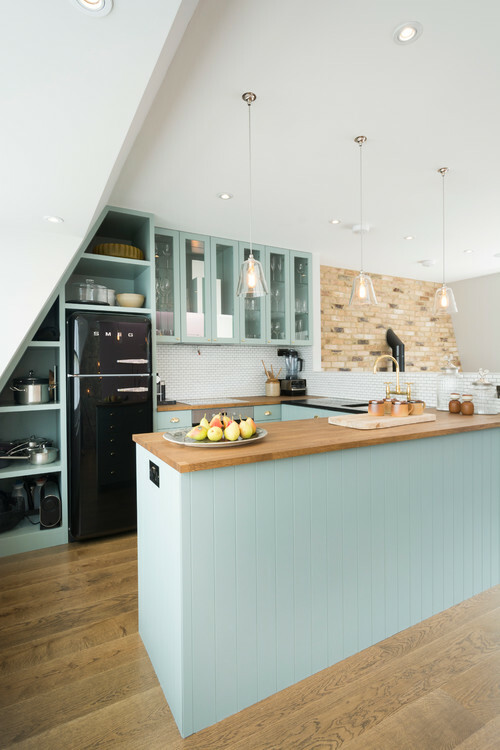 And, like I do, I started pondering the idea of how best to design a kitchen filled with color in such a way that it could be changed as color preferences changed. 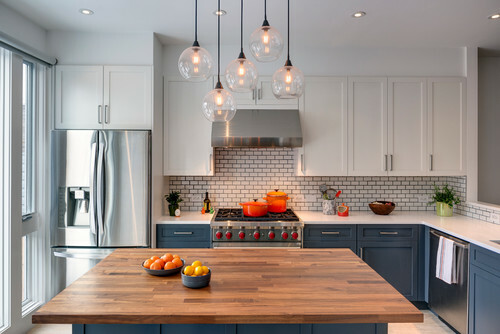 So, I went searching for some perfect examples and came up with this simple list of ways to design your next kitchen with color for a real show-stopping design. Paint is your friend. 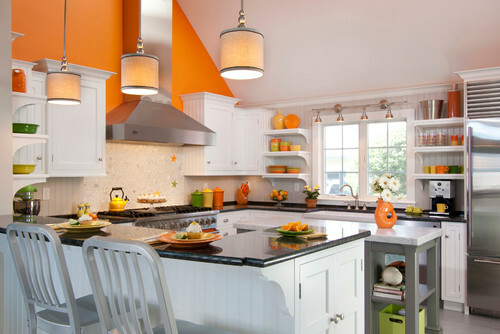 Of course, the easiest way to bring color into your kitchen design is to use paint in smart ways. A neutral palette of surfaces and cabinetry is the perfect opportunity to go bold with colorful walls. The beauty of using paint for your splash of color is how you can always change it depending on color mood. Fabric and decor adds the right amount of color in the right places. Similar to paint, decorative elements can also be the perfect way to bring color into a space. 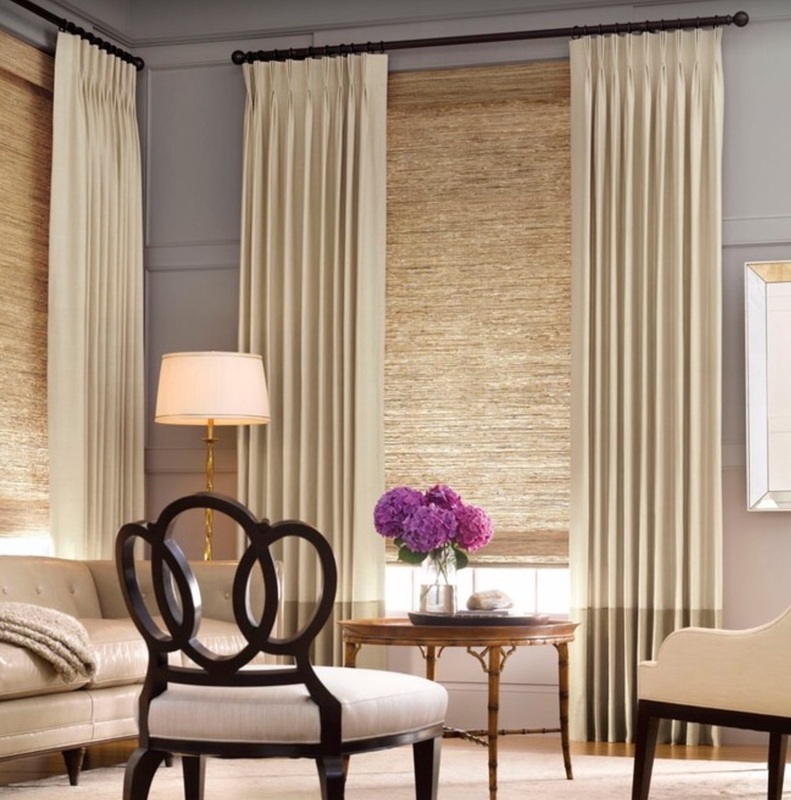 In the space below, a simple roman shade brings in a nice punch of color in this otherwise neutral space. Window treatments and upholstered barstools are great ways to bring in colorful fabrics. Consider too the connection with adjacent rooms. It will make all the difference in how the kitchen connects with the rest of the house. Requiring slightly more devotion, go bold with your backsplash. 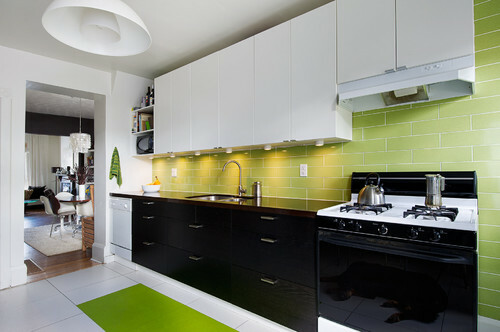 In the grand scheme of things, a backsplash provides you a great design opportunity to be bold with your chosen color. And, if you want to switch it out down the road, it's only slightly more disruptive to change out. The key here, by the way, is to make the other surfaces relatively neutral. Nothing screams devotion like cabinetry in a specific color. For the true color devotees, this is your chance to go bold or go home. 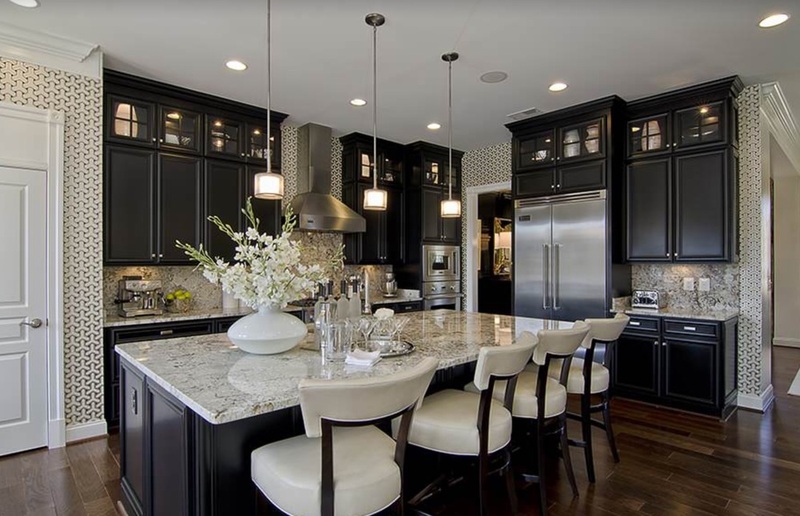 While not as easy to change out down the road, putting a color on your cabinets makes the strongest statement. In the examples below, notice how smartly color is used. While bold, in their own certain ways, each room has a strong color story mixed with beautiful neutrals. The proportions are all balanced and the color doesn't over power the rooms. If you're going to paint your cabinetry, consider a subdued color, a white washed blue or lighter version of your favorite color. This keeps the room from feeling like a clown house. 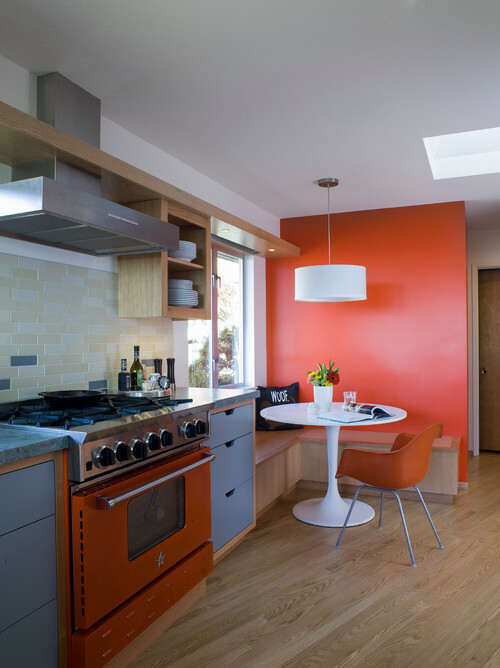 Depending on your level of devotion or propensity to risk taking, having a colorful kitchen isn't out of reach. 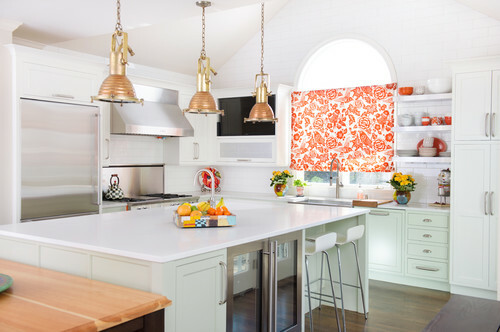 I hope these examples of colorful kitchens have shown you how easy it can be without locking yourself into a color (unless that's what you want). Don't be afraid to use a little color in a bold way. And, if you need help navigating the design world, give JASON BALL interiors a call. We're glad to help. As a follow up to the Before & After entry from a couple of weeks ago, let's look at what happened in the laundry room of this project. As I mentioned before, this house is so typical of many suburban homes built in the 1980s and 1990s. And, when it comes to the laundry room, they clearly didn't have an interior designer help them with the space planning of the room. The standard layout was a large closet with bi-fold, louvered doors on one end, a small laundry room sink and the washer and dryer crammed into the other side. This really is the epitome of an inefficient use of space. So, what if we get the chance to reconfigure the space for today's lifestyle? What layout changes make sense? And, how can we improve on the traditional, less than optimal layout? Well, let's use this one as a case study and look at the before picture to see what we were dealing with. A poorly designed storage area, an less than optimal laundry area had to be dealt with in a way to not only improved the space, but also was set up for an active family. As you can see from the "after" picture below, we not only gave the family more functional spaces to work with, but also brought some great style into a room that is usually forgotten. A great two-tone herringbone tile floor, white quartz counters and clean white cabinetry make this a place anyone would want to spend some time working. ABOUT JASON BALL interiors. Jason is an interior designer based in Portland, Oregon serving residential and commercial clients throughout Oregon and Washington, and beyond. To see examples of his design work, visit the Portfolio page. 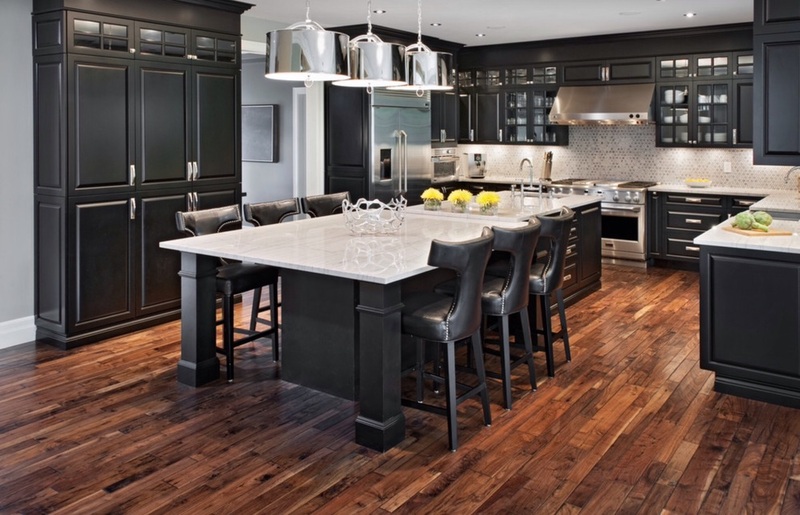 For an evaluation of your upcoming projects, contact Jason Ball at (503) 267-2352 or via e-mail at jason@jasonballinteriors.com.